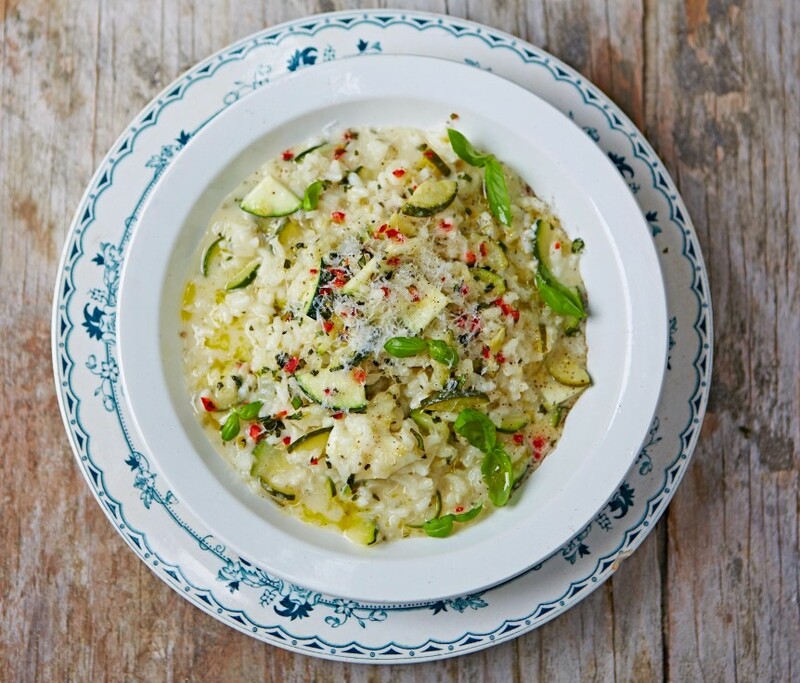 This is the coming together of three beautiful ingredients – mozzarella, basil and courgette – to make an oozy, cheesy, scrumptious risotto. White wine gives any risotto a beautiful depth of flavour, but don’t worry if you haven’t got any, swap in the same amount of extra stock instead – it will still taste fantastic. This recipe includes two of your 5-a-day, so it’s comfort food that still delivers on the nutrition front – you’ve got to love it! Peel the onion and garlic, trim the celery and finely chop all three. Place a large saucepan over a medium-low heat. Place the butter in the hot pan with the onion, garlic and celery, a splash of oil, and a splash of water. Reduce the heat to low and cook for around 5 minutes, or until softened, stirring occasionally. Trim the courgettes, slice lengthways into quarters, then chop into small ½cm chunks and put to one side. Fill a medium saucepan with 800ml water. Add the stock cube and bring to the boil over a high heat, stirring to dissolve, then turn the heat down to low. Pick and reserve the basil leaves, then add the stalks to the pan of stock. Finely grate the Italian hard cheese. Once the vegetables are very soft but not browned, add the rice to the pan. Stir and fry the rice for 1 minute until translucent, then add the wine (if using) and keep stirring until it has been absorbed by the rice. Turn the heat under the rice up to medium, then add a ladleful of hot stock, avoiding the basil stalks – these are there to add flavour but not to be eaten! Stir constantly and continue adding stock, a ladle at a time, waiting for the rice to soak it all up before adding the next ladleful. Continue until you’ve used two-thirds of the stock. Finely chop the basil leaves and the chilli (deseed the chilli if you prefer a milder heat). Stir the chopped courgette into the stock, and keep adding it (courgette and all) until the rice is cooked and the risotto has a nice oozy consistency – if you run out of stock, use boiling water. Take the pan of risotto off the heat. Tear the mozzarella balls into pieces and stir into the pan with half the basil. Stir through half the grated Italian hard cheese, then season to taste with a good pinch of sea salt and black pepper. Cover with a lid and allow to sit for two minutes. Divide the risotto between four plates, scatter over the remaining cheese, basil and the fresh chilli, then tuck in!